Porcelain veneers are getting more and more common these days with teeth issues becoming more of an issue and people having more need and want to get it fixed. 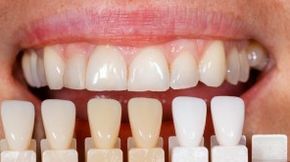 So now we are seeing veneers used for more than just a cracked of chipped tooth, many people get them for looks and just to make their entire smile a more improved quality. So then because we see them more often the question that comes up more often now is how do you keep the veneers maintained, clean and white like everyone else’s smile, or the rest of your teeth if you only have a few veneers. Luckily for the most part porcelain veneers are fairly maintenance free and if you just brush them like you would your normal teeth you should see no issues. However sometimes things come up and overtime you might see issues. Once you notice discoloration of your veneers there is one thing that you must remember one thing to you can’t whiten veneers with bleach treatments like you can natural teeth, it does not work and may damage them further. However there are ways that you can try to whitening the teeth below the veneers or get a dentist specializing in cosmetics to do it. There are three methods you can use for whitening the teeth below a veneer. They are a tooth-whitening system, gentle polishing toothpaste and a dentist who specializes in cosmetics. The first thing you must know before you do will be to know the kind of veneer you have, there are different brands and types. Knowing the type will matter on what you can do with them. Bleaching the teeth below the veneer or the back of the teeth is the first way you can try to fix the discoloration. By doing this kind of treatment it will cause the natural tooth to lighten and so then reflect through the porcelain veneer on the top. The second treatment to try is using toothpaste that is designed to remove stains from veneers. You can ask your dentist for the best supplier in your area. Toothpaste that will gently polish is the best way for minor staining that would show up around the edges if the veneered teeth. Using this kind of polishing toothpaste should remove the buildup of composite around the teeth without any problem. The third and final option for getting veneers whitened is seeing a cosmetic dentist. More often than not your veneers are discolored because the glaze that goes over the porcelain has come off. A good cosmetic dentist can clean them with the right tools so they are white again and if the worst happens can replace them for you without any issue.